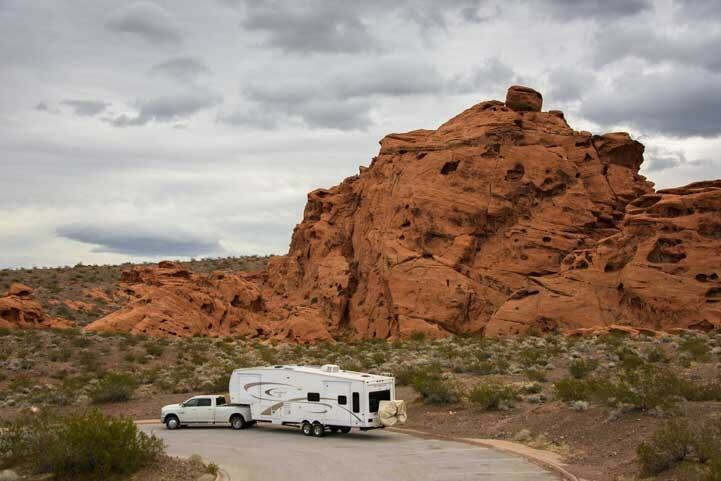 Lake Mead Scenic Drive + A Great RV Pit Stop at “Redstone” NV! 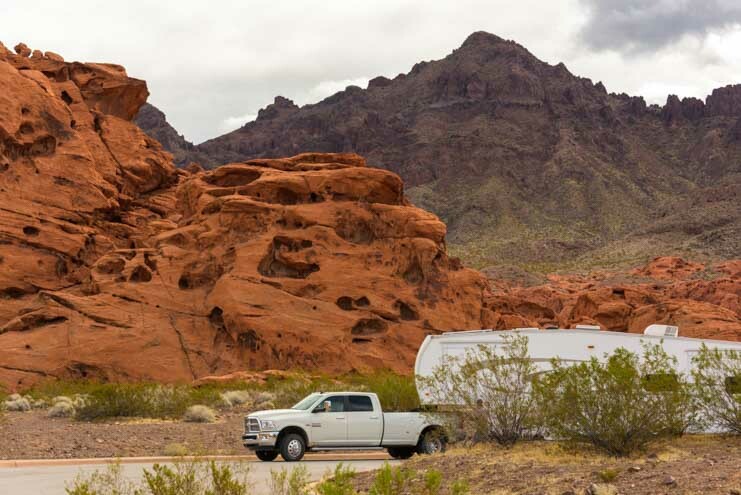 December 2017 – We try to avoid interstate highways and big cities in our RV lifestyle, and when we began our trek south from southern Utah towards Arizona a few weeks ago, we wanted to limit our time on I-15 and avoid the congestion and traffic of Las Vegas. 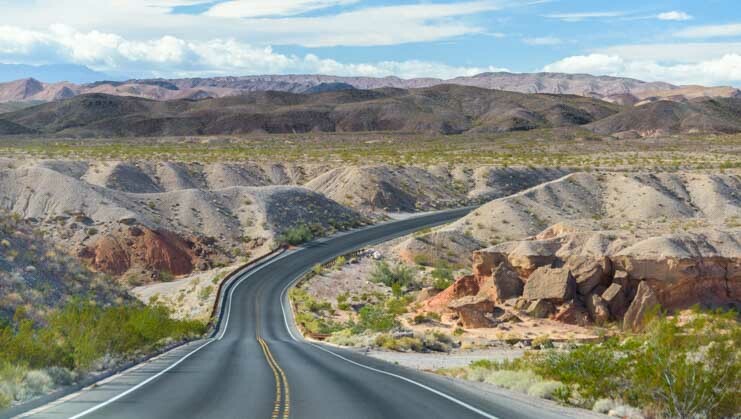 We found a delightful scenic drive that skirts around Las Vegas! 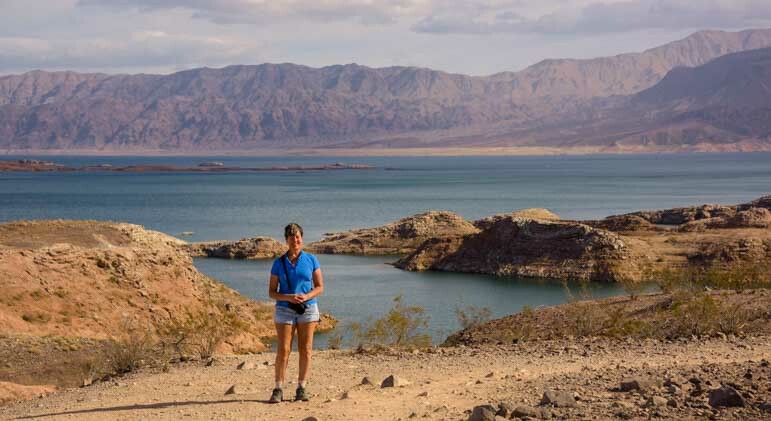 We took a jog south off of I-15 onto Nevada Route 169 and followed the contours of Lake Mead all the way around to the southeastern side of Las Vegas. 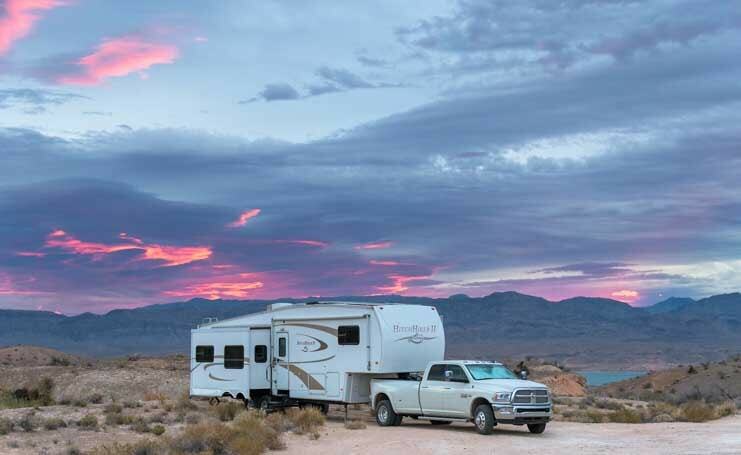 What a beautiful and delightful RV trip! 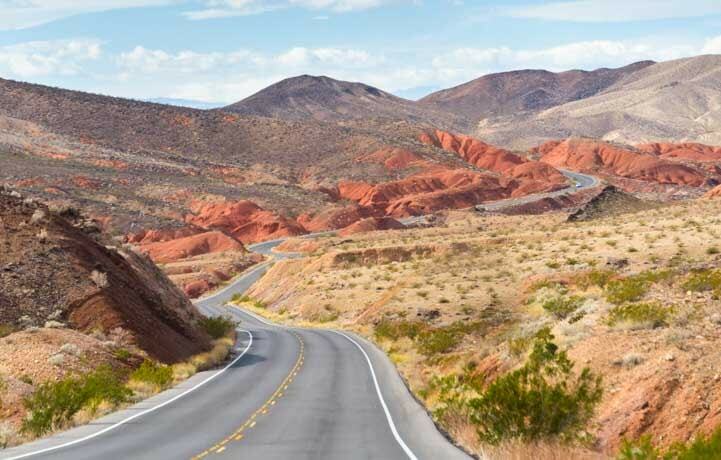 The road takes a wonderful journey through rocky and colorful terrain. The road rose and dipped and swerved left and right, revealing gorgeous scenery all along the way. Even though we didn’t have a great day weather-wise, the scenery was fantastic! 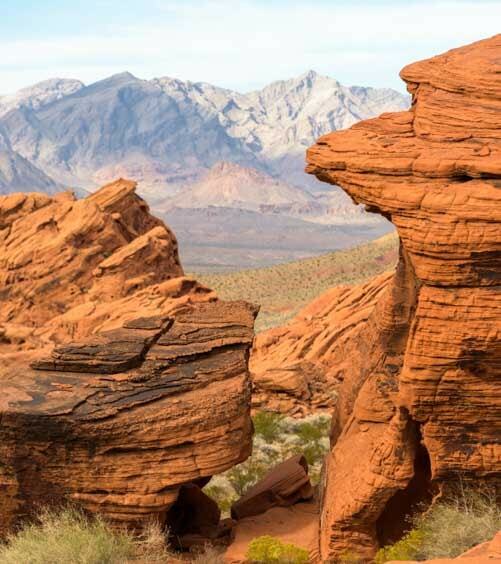 As we drove along, happily chatting away about this and that, we passed the turn-off for Valley of Fire State Park. We LOVE this stunning park and have visited it several times (blog posts here and here), but with a bit of regret we passed it up this time. Suddenly, we saw a sign for the Redstone Picnic Area. We needed to take a break and get a little lunch, so we pulled in. 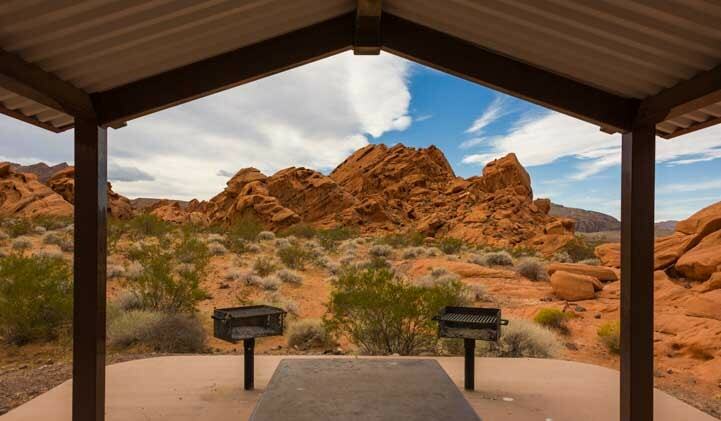 Redstone Picnic Area – A fun RV pit stop! What a wonderful surprise this little jewel was! 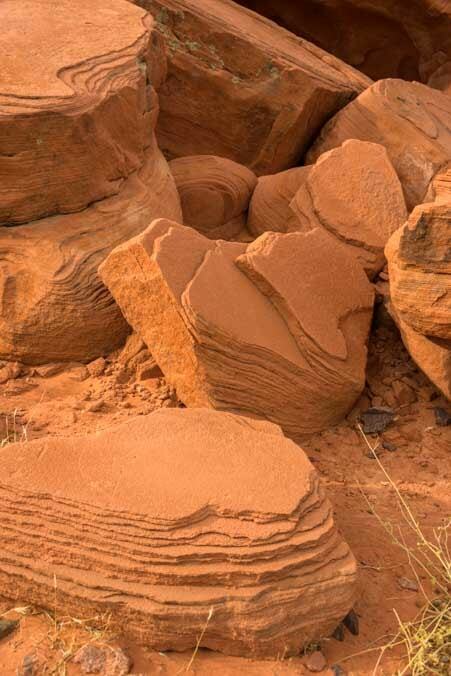 It’s like a little mini taste of Valley of Fire! There were pretty picnic ramadas scattered about the edges of the parking lot. A nice place to take a breather from driving. Never mind lunch, we had photos to take! We jumped out of our truck and began snapping away. The red rock formations were so cool we both even took photos of the rocks framing the vault toilets. It’s gotta be a pretty spot when two photographers both feel inspired to take pics of a vault toilet building!! We were loving the scenery so much we both took pics of the vault toilet building! 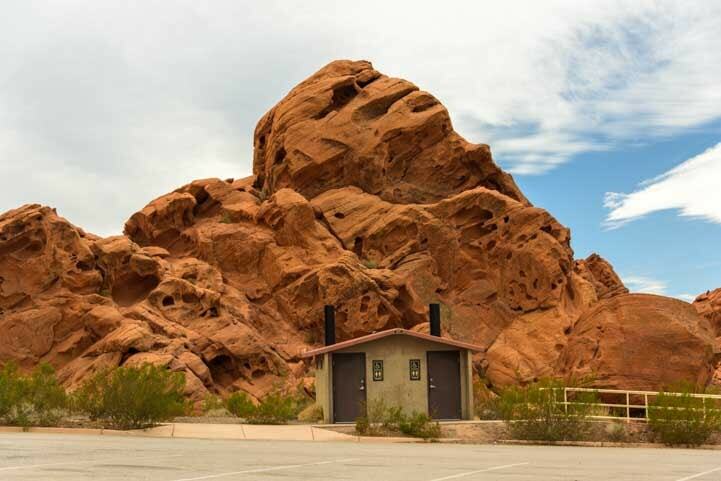 The Redstone Picnic Area has a short hiking trail that leaves the picnic tables behind and ventures out into the red rocks on a lovely loop around a huge red rock mound. I headed out on the trail for pics there while Mark moved in close to the red rock hill and got some great shots of the formations. The weather was overcast, but what fun we had scrambling around on the rocks. 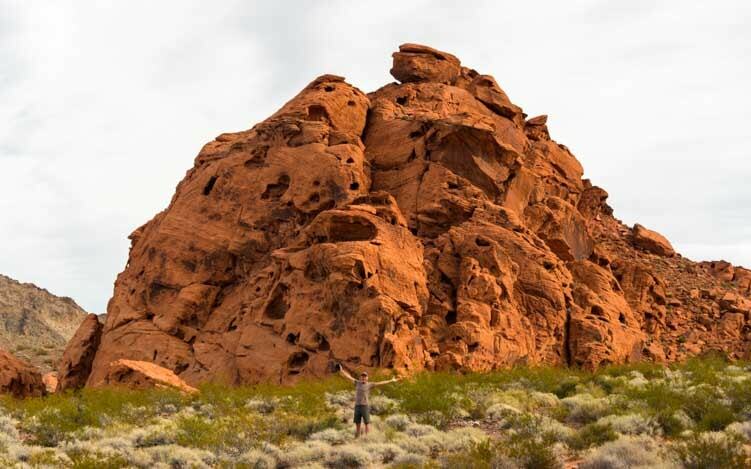 One of the things that always baffles me about the big rock and mountain formations in the west is the various “uplifts” that have occurred where wide flat expanses of rock have been upended by natural forces long ago. 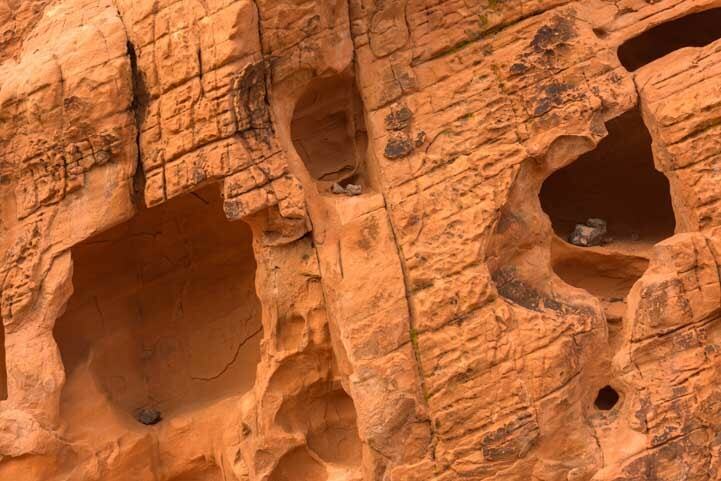 We also loved the various hollows and rounded alcoves and windows we found in the rocks. A car or two pulled up during our stay but they moved right along after using the facilities. We were having so much fun crawling around on these beautiful red rocks. We didn’t want to rush our visit! The hiking trail revealed some wonderful views on the far side. As the hiking trail rounded a bend, we could see far off into the distance. And the gods painted the skies with fantastic patterns of sun and clouds just for our photos. The sun played hide-and-seek and cast cool colors across the lens. 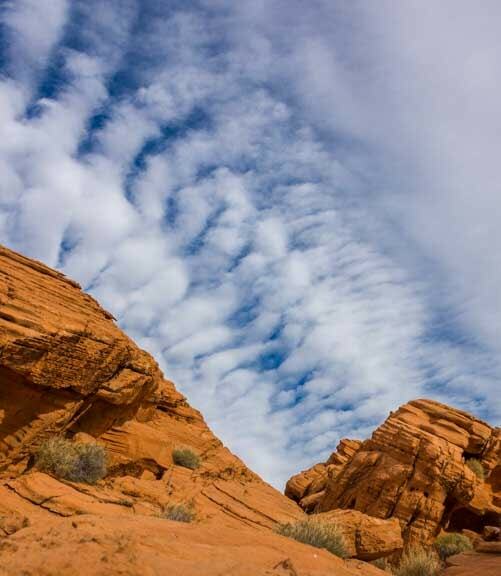 The clouds lined up for a photo op. When we finally got back to our trailer, we got out our lunch goodies and sat down to yummy sandwiches. What a nice break this was! Back out on the road we saw more wide open expanses and lovely views. 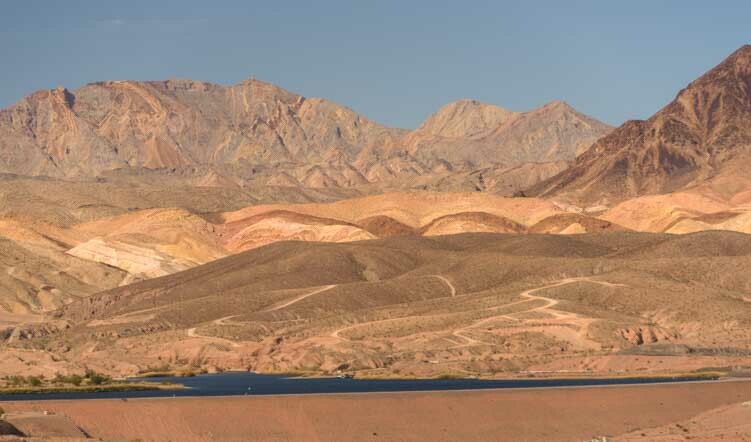 The Lake Mead scenic drive continues. 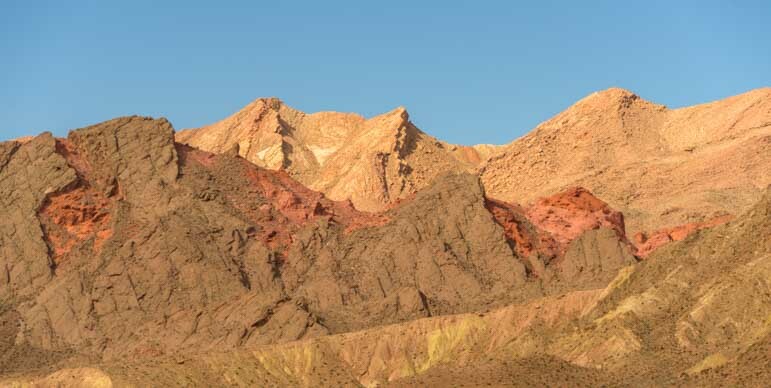 The colors in the distant rocks and hills were wonderful earth tones — real earth tones — that reminded us of our trip to Death Valley years ago. Reminiscent of Death Valley, California. The brown crus peels off to reveal crimson rocks underneath. 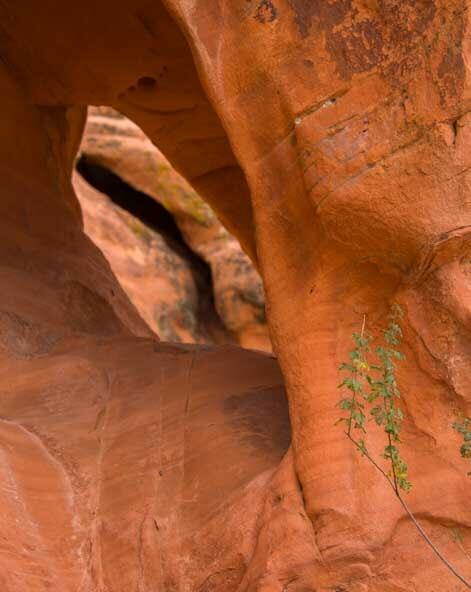 At times we saw pockets of red rocks poking through. 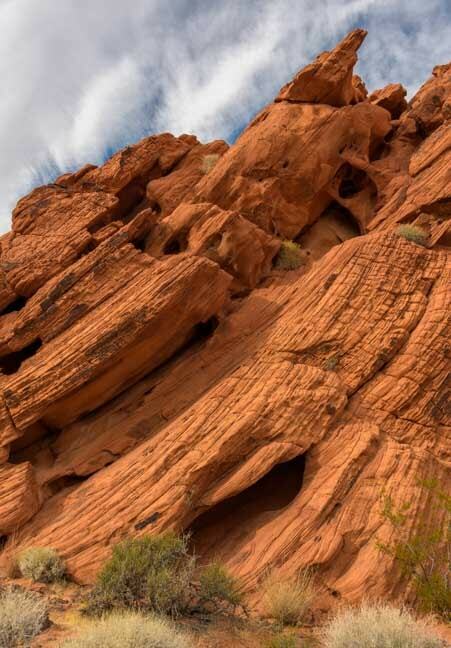 Vibrant red rocks add a splash of color to the landscape. And then we finally arrived at the shores of Lake Mead. We stopped at a big parking area and wandered out to the edge of the overlook. Beautiful! From red rocks to lake views – what a drive! 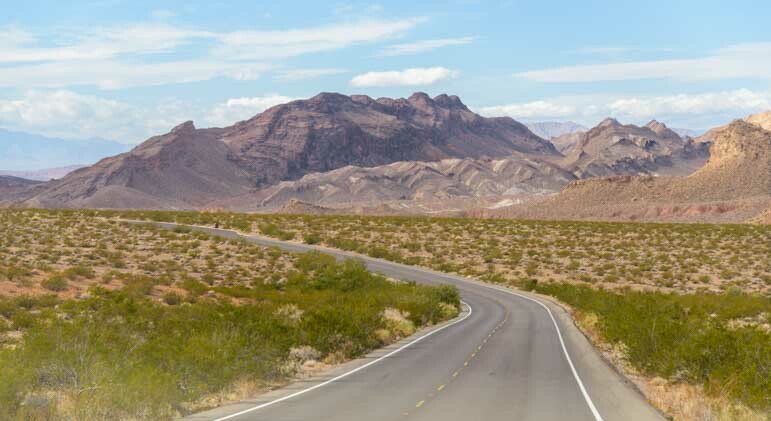 If you are headed south on I-15 with your RV to get to Arizona and other parts of the southwest for the winter, or if you plan to take your RV back up north via that route in the spring, plan a detour around Las Vegas and check out this lovely scenic drive on the back side of Lake Mead! A few posts from Nevada too! 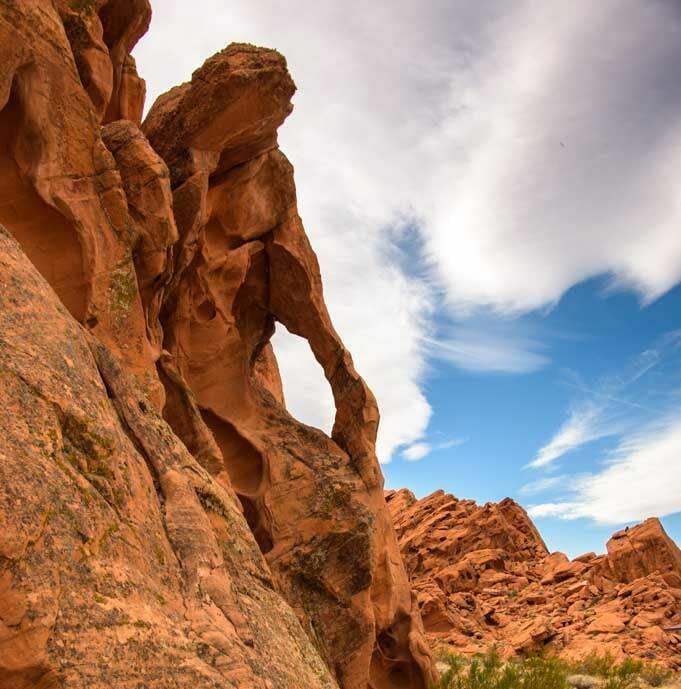 This entry was posted in Nevada and tagged Nevada, New, Travel, USA, WP Travel by Roads Less Traveled. Bookmark the permalink. Seriously, more great pictures in this post, both taken with the camera and those painted by your words! Thanks for sharing! I put a little something in your stocking! Very funny, Jeff!! We feel your pain!! We put in our decades of work too, and we know what it’s like. I went for 7 months without a single day off at one point, not a Saturday or a Sunday or any day. So now, every morning and throughout the day, Mark and I give thanks for being able to live this incredible life. Your time will come too, and in the meantime I hope our pics and stories give you an idea of the beautiful places that are waiting for you!! And thank you very much for the Christmas gift — what a great surprise in our stocking! We hope you and your family have a wonderful and Merry Christmas! Great pictures. Have to check that hike out next time. We stayed at Stewart Point last month. Really enjoyed that spot and the area. I’m glad you’ve had a chance to explore the area too. 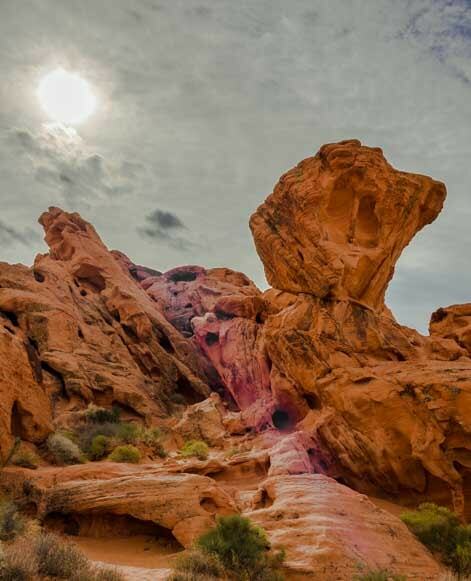 We loved it and Valley of Fire too! You take the best pictures (with the help of the fantastic scenery). It looks like you had the “road less traveled” all to yourselves. We did have the road all to ourselves for much of the drive that day – very cool! Thank you for the compliments on our pics — we have such fun with our cameras! Emily, all of the pictures you take on your adventures are stunning; most, beyond words. I’m curious as to if you actually print many of them off on photo paper, or are you content to archive them digitally? If you keep them stored on a computer, do you back them up? You must have tens of thousands of images. Please keep adding to my bucket list of places to visit; I certainly appreciate it! Thank you for appreciating our photos so much, David! We each take about 35,000 photos a year and we have many terabytes of archive storage and backups. We occasionally print our photos for friends and family. We also get a huge thrill out of seeing our photos in print on magazine covers and decorating our magazine articles and in advertisements as well. Developing our photography skills has been a huge part of our personal growth during these years of traveling, and it’s a hobby that has enhanced our adventures immensely and intensified what we see when we look at the world! Wow, you guys really know how to take photos! You can really bring out the beauty of nature…..but Jeff has a point in his post! It’s 10 degrees up here with the sun shining and your photos really warmed us up! 10 degrees… ouch! But with a little snow you’ll have a beautiful white Christmas!! Thanks for the post! Wally and I are going to Las Vegas for the Consumer Electronics Show in January and this could be a neat side trip on the way back. 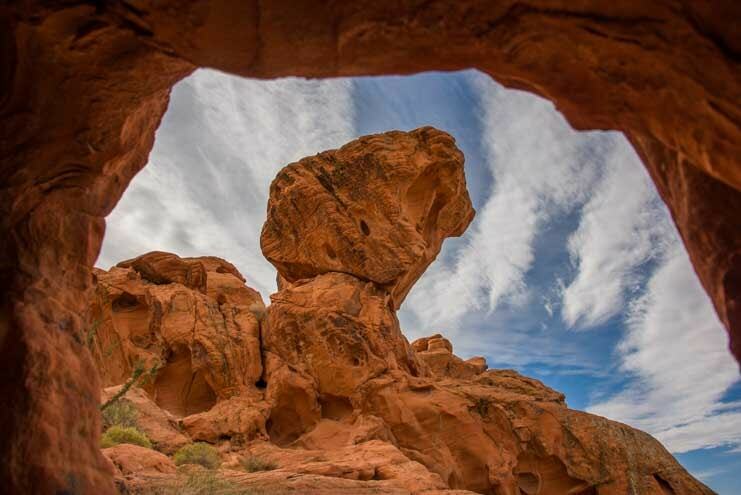 We spent many years at Lake Powell and miss the beautiful red rocks and scenery. I love that you take 35k pictures a year!!! Not sure if you are still riding your Seven bicycles. Hope to see you on the road sometime. The CES show would be an awesome event to attend. Have fun there! Our Sevens have been in storage since we started full-timing and now we zip around on our mountain bikes between taking all those 35k photos (or while taking photos!). Thank you for the tip to take 169. 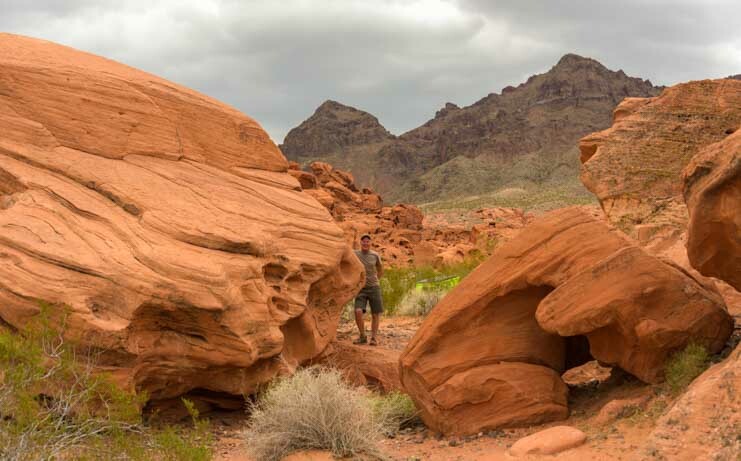 We will be finally getting to spend more time in NV next spring and looking forward to Lake Mead and Valley of Fire. Great pictures! You are welcome, Debbie. 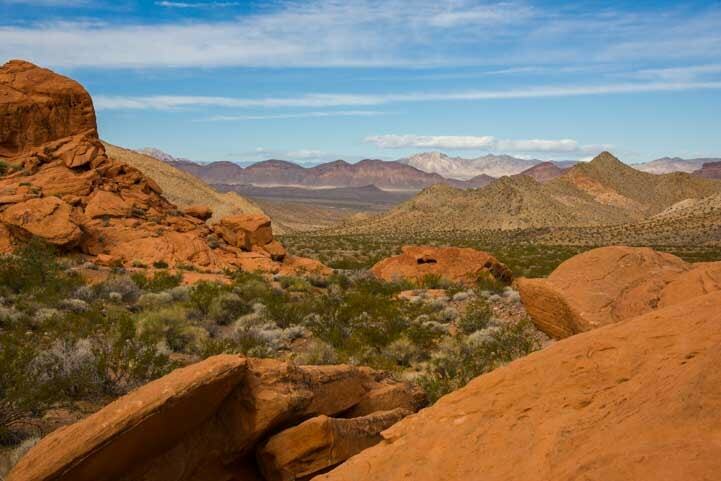 Enjoy your travels in Nevada! As always, a very classy blog. You two are the best. Merry Christmas 🎁🎄 and may next year be right up there with the best. Thanks so much for all your sharing and creativity. Thank you very much for the high compliments, David. It means so much to us to know that our efforts are appreciated. And thank you for your very generous contribution to our site on this beautiful Christmas Eve. We wish you and your family the very best on Christmas and hope your dreams come true in the New Year!